Hi, I'm professor EnGram. Nice to meet you! These pages are for learners of English as a second (or third, good 4 you!) language. You need to have a rest after studying English grammar, you say? Who wouldn't! So, let's have fun! But first meet my best friend and my student FonTyler. 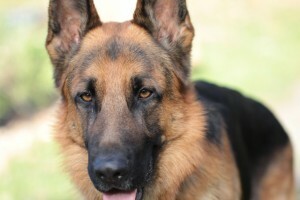 FonTyler is a German Shepherd. He is two years old. He is big for a German Shepherd. But there are bigger dogs. He is strong. And he is disciplined… well, most of the time. FonTyler is very clever. He knows some very important English phrases: Sit! Stand! Stop! Jump! And, most importantly, Eat! What does he like to do? FonTyler likes to run, to jump, to play and to chase cats! Oh, look, he is chasing a cat! - Stop, Tyler, stop! That is bad! Do not run after the cat! And FonTyler stops. He doesn’t want to be a bad boy. He wants to be good. He looks sad. He looks back at me. And then he looks to see where the cat is. He cannot see the cat. The cat is high in the tree! FonTyler comes back to me, and he wags his tail. - That’s good, Tyler, that’s very good. Tyler is a good boy! FonTyler is happy. He doesn’t like cats, but he never hurts them. That is good to know. to chase = to run after, преследовать. Только не путайте с Chase Bank! Не путаете? Good 4 you! Обратите внимание на то, что предлог for может заменяться на числительное 4 - звучат-то они одинаково! Who wouldn't (need to have a rest after studying English grammar)! Сослагательное наклонение: Who wouldn't (А кому не понадобился бы отдых... / Ну, это не удивительно!) мы пока что рассматривать не станем, просто постараемся запомнить эту фразу - пригодится!